As we approach midterms (I know, already! ), you may be testing out those red pens, doing wrist-strengthening exercises, and stocking up on chocolate-covered double-espresso beans to help get you through the grading that is to come. But grading doesn't have to be this way. Really. So how can you reduce the time and energy required to grade? I'm concentrating here on written work (lab reports, essay exams, thought papers), and will focus on other types of assessments in future posts. 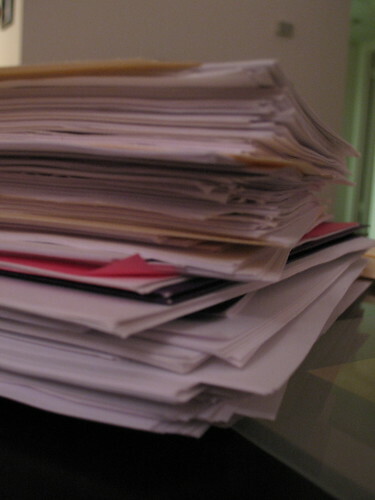 1) Have as much written work submitted electronically as possible. Although some instructors are "old school" about grading by hand, once you get used to reading on the screen and providing type-written comments you'll realize that it's much faster. Other perks: you're saving paper, you have a copy of all of your comments saved to your computer, and students will never complain about your hand writing again! 2) Have a well-defined rubric. We always recommend not only creating clear grading criteria and weighting of points, but also offering this to students ahead of time. All of my written assignment descriptions are accompanied by the rubric right in the syllabus. On exams, whenever I include multiple-part written answer questions, I am sure to include the point breakdown. This helps students focus their efforts on the most important points, and actually leads to better formulated responses. When it comes time to grade, you can convert your rubric into a checklist and simply go down the list. Students are less likely to be confused about why they earned the grade they did, and you've sped up your grading time considerably. Never created a rubric before? Come to us for guidance. Or try RubiStar, where you can create your own rubrics for free. Bonus points: Pair this tip with the previous one and complete and return all of your rubrics electronically. This is an ingenious tip from Darrell Coleman, Assistant Director of the Center for Teaching & Learning Excellence. Have you ever noticed as you grade that students always seem to have trouble with the exact same concepts? There are always patterns in the errors students make; the same confusions appear from semester to semester. So why should you have to respond each and every time the same mistake is made? Well, you don't. If you create a document with all of the comments you make the first time you grade an assignment, you can simply go back to that document and cut and paste each time you need to make the same comment again. Brilliant! What are your time-saving tips for grading written work? We'd love to hear them!